A new important distinction for Miloterranean! 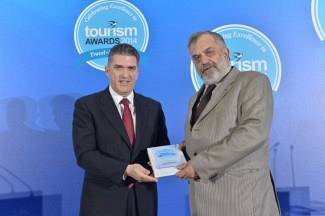 Miloterranean was presented with the Silver Award in the “Community & Social Development” category, at the Tourism Awards 2014. Receiving the Award, Spiros Tzintzos, S&B Milos Operations Manager and member of the managing committee of Milos Mining Museum, referred to the close relationship between tourism and mining in Milos, highlighting that «S&B’s heart beats in this beautiful island for over 80 years. Therefore, supporting its sustainable development by promoting the island’s other main economic pillar, tourism, is taken for granted. This award, presented today by you, the tourism professionals, comes as a recognition for our responsible conduct, but as a recognition for Miloterranean as well». Placing Milos at the top of the Greek tourist destinations will be our goal while continuing our efforts with enthusiasm and passion.